One of the most important tools in my consulting toolkit is Information Mapping, both a formal method (approach) to writing and a format (visual style) for writing. I personally have written thousands of pages of documents in this method/format, from memos and proposals to project charters and training materials. I recommend it for most business writing for the advantages it offers both the writer and the reader. I learned Information Mapping in 1993 as a manager in consulting at KPMG. I brought the method to Coca-Cola Enterprises Inc. in 1994. It became the standard for training documentation and technical writing by the Information Technology department, and many of my colleagues adopted the format for their own use. Providing a real-life example of traditional business writing and how it was improved by the Information Mapping method/format. Presenting an overview of the concepts of the method and the typical formatting. Sharing some practical tips on using the method and addressing some of its shortcomings. Listing additional resources if you are interested in learning more about Information Mapping. Read the following two one-page memos written with the same purpose: to communicate to the company’s customers a very important change to a procedure. The first memo displayed below was the original draft given to me to proofread. I suggested rewriting the memo in the Information Mapping method, asked some questions for clarification, and quickly drafted a new version. 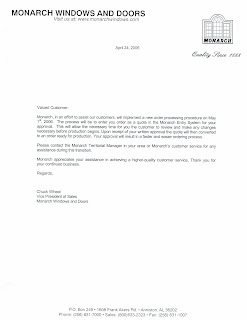 The revised memo displayed below was the one actually sent to the customers. 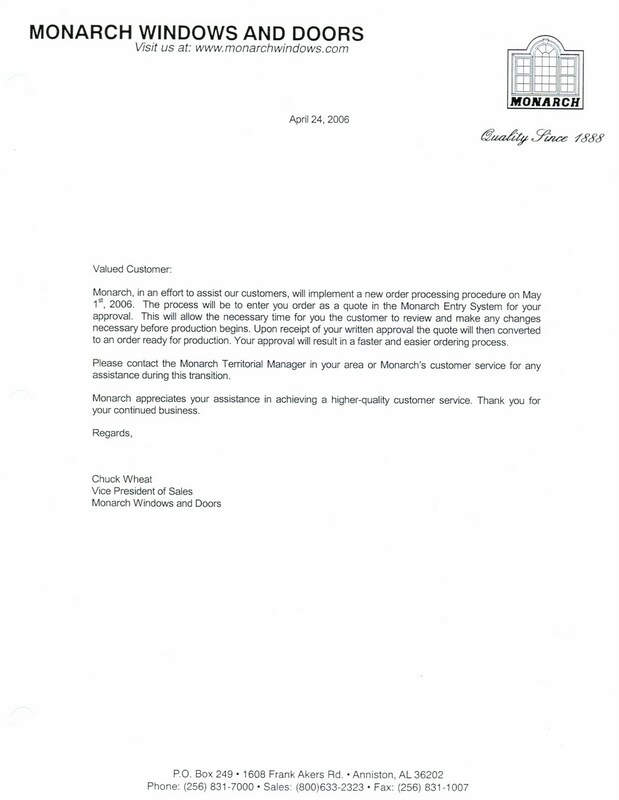 The original draft (Example 1) uses a typical memo style of writing used in business. The procedure changes are embedded in the first paragraph and are difficult to follow. The revised memo (Example 2) uses the Information Mapping method of writing. The change, benefits, new procedure, and contact information are clearly presented to the customer. The process of organizing the information in the memo exposed gaps in content in the original draft. Since the original draft memo was not distributed, it is not possible to measure before and after results. A comparison of the two memos suggests the revised memo anticipates and addresses concerns and questions that would have arisen with the original draft, reducing confusion, e-mail follow-ups, and telephone customer service calls. I consider Information Mapping to be both a method and a format. I make that distinction because many people become aware of the look of an information-mapped document (the format or visual style) without realizing there are underlying principles and techniques (the method) to the writing. Information block: One or more sentences, a diagram, a table, and/or a list about a limited topic. The content is based on the purpose or function for the reader (not the writer). This replaces paragraphs. Note in the example revised memo presented above, there are four information blocks: Change (with some sentences about the change), Benefits (with a list of benefits), Procedure (with a table presenting the steps and actions to take), and Questions. Information map: A collection of relevant information blocks about a limited topic. 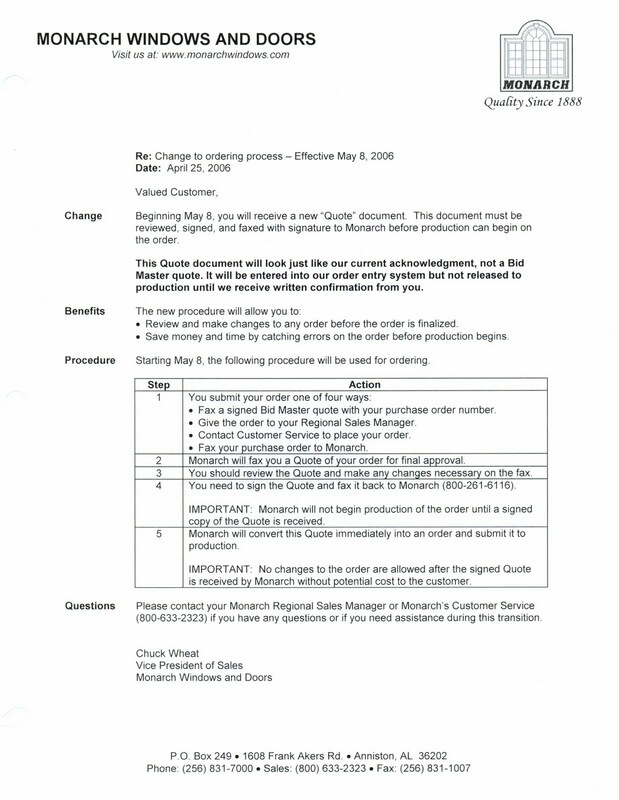 In the example revised memo, the one page is an information map about the change to the ordering process. Another example of an information block and and information map is presented below. In this example two pages of the same information map is displayed. Information Mapping is based on several principles applied to writing. These principles are based on research conducted by Robert E. Horn, who founded a company (Information Mapping, Inc.) to commercialize the findings. Chunking principle All information should be grouped into small, manageable units. Each information block in Example 3 illustrates chunking. And each information map is a chunking of an overall document or section. Relevance principle The information grouped in a unit should relate to one relevant point based on its purpose or function for the reader. The "Description" information block in Example 3 only gives a description, nothing more. The "Sources of information" block only lists the sources. Labeling principle Each relevant unit of information should have a label to “advance organize” the content of the unit for the reader. 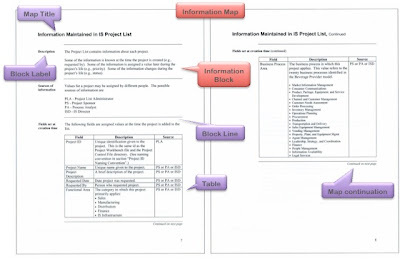 The map title ("Information Maintained in IS Project List") in Example 3 is a label for the map. "Description", "Sources of information", and "Fields set at creation time" are labels for the information blocks. A reader can scan these labels to find a chunk of information more easily as a result of this principle. Consistency principle Information presented should use consistent words, labels, formats, organizations, and sequences. Business writing is not creative writing; the same word should always be used consistently. In Example 3, the word "project" is consistently used throughout the document. Integrated graphics principle Diagrams, tables, pictures, and other visuals should be incorporated as an integral part of the text, not as an afterthought added after the writing is completed. Example 3 includes a table to visually depict the data, rather than narrative which buries the data in text. Accessible detail principle Writers should write at a level of detail that makes the information the reader needs readily accessible and put what the reader needs where the reader needs it. Example 3 shows the "Sources of information" abbreviations immediately above the table that uses those abbreviations. The reader should not have to flip to an appendix to find out what the abbreviations mean. Hierarchy of chunking and labeling principle Small, relevant units of information should be organized hierarchically into larger groups and provide labels for each larger group. Example 3 only shows one information map. It is part of a larger document that contains additional maps which are organized under a chapter of a document. The document as well as the chapters, information maps, and information blocks are all labeled. These are all depicted in Example 3. 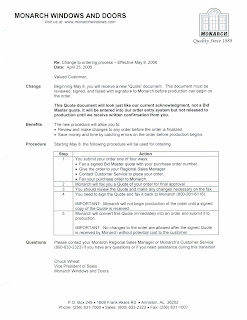 The Information Mapping company sells a template for Microsoft Word that helps writers create and format Word documents in this style more easily. There are specific rules prescribed by the Information Mapping method. It is good to learn them so you fully understand the concepts and why they are important. But once you learn them, adapt them to meet your own needs. As an example, the method leverages Miller's Law, which states the number of objects an average human can hold in memory is 7, plus or minus 2. Thus, the Information Mapping method states a bullet point list should not have more than nine items, a table no more than nine rows, a map no more than nine blocks. It is a nice guideline to keep in mind, but there are examples where following this rule would split information unnecessarily. Use your good judgment. Because I have been writing this way for many years, I have a feel for when a map needs to be broken down into multiple maps. This occurs throughout the writing process. The document morphs and changes as I write, adding new information, creating new blocks, breaking apart maps, identifying new maps. I think and write at the same time and use an infomap template to facilitate the process. I find few shortcomings to business writing using Information Mapping. Here are a couple I will point out, along with suggestions on how to address. “A fool with a tool is still a fool.” Just because it looks like an information-mapped document with map titles and block labels does not mean it is written well. The writer may not have an understanding of the underlying principles or the writing skills to put them to use. I address this twofold: first, by determining who has the aptitude to write well (some people do not have the aptitude), and secondly, by training people on the method and on writing. On small projects, I typically provide introductory training myself with the group in less than three hours, and I include Microsoft Word training in the mix. (Side note to reader: It is amazing how many users of Microsoft Word do not understand style sheets and tables, two of the most powerful features of the software.) I would recommend full-time writers that want a deep understanding of the method and want to practice and get feedback from experienced Information Mapping instructors take a formal class from the Information Mapping company. Documents written in the Information Mapping format tend to be larger, both in pages and file size. There is more whitespace on infomap formatted documents. The block labels take up a column of space on the left of each page. The block lines spread out the text more. Information blocks that do not fit at the bottom of the page are moved to the next page, adding to whitespace at the bottom of the page. The pervasive use of tables and graphics tend to increase the size of a document. The key, though, is whitespace and better presentation make it better for the reader and for communication. I somewhat address this by making my own infomap Word template and reducing the text size from 12 point to 10 point. This reduces the number of pages since more text fits on a page. It also usually means more blocks can fit on a page (if you do a good job chunking), so there is less wasted space at the bottom of each page. Attend an Information Mapping course. The Information Mapping company provides training programs on the method, and it comes from the owners of the method. Read a description of the seven principles at TechWriter Wiki. Read the 1993 paper by the founder of Information Mapping, Robert Horn, titled “Structured Writing at Twenty-five” (a pdf document). The content is good. Unfortunately, it is written in neither Information Mapping nor Structured Writing. Other links to his writings are here at his Stanford University website.